I’ve been busy prepping kits for a session with the Brush Benders early next week and working on Christmas projects for upcoming classes but this beautiful weather just beckons me outdoors! Not only have I sat outdoors watching the birds play in the pond – they’re very active in the stream this time of year for some reason – but also convinced Dennis to take another walk at Kensington. What a lovely afternoon we had on the trails. Seen two deer and lots of chipmunks. Being active just makes me feel better – and the fresh air doesn’t hurt either! This cooler weather also makes me want to cook! I checked the freezer and found two chicken breasts so took one out to make chicken noodle soup and some blueberry muffins. 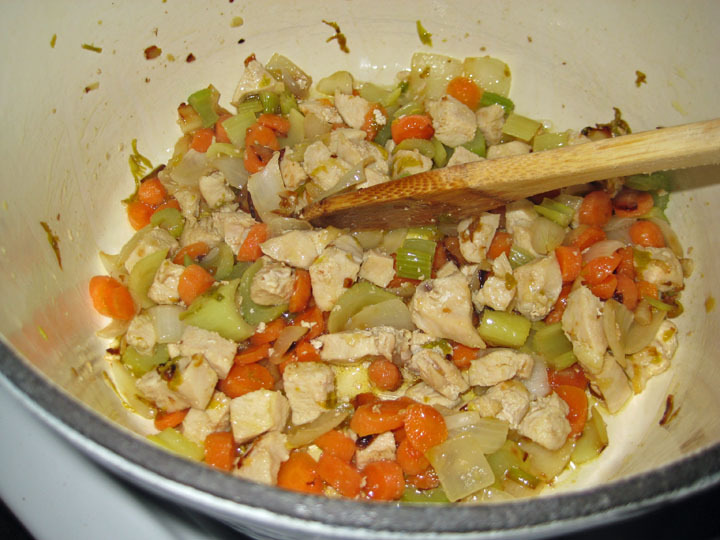 While the veggies were sauteing I suddenly got the urge for chicken and biscuits instead. Easy change, just needed to run to the store to buy cream. Dinner was good so I’ve included the recipe for you – bon appetite! Now, back to my artsy mess – Focus, stay focused! Watch my blog calendar for class additions, updates and locations. Scoop all the cooked ingredients to one side and add about 1/2 cup flour to make a roux; if not enough oil I add about 1/2 stick or more of unsalted butter and cook the roux till golden brown. Bring to a boil and sauce will thicken. I add about a half cup or so of cream after the sauce has thickened (it usually gets really thick and the cream brings it to gravy consistency) along with a cup or so of frozen petite peas. Mix dry ingredients into a bowl. Cut in the shortening till like coarse crumbs. Make a well; add milk all at once. Stir quickly with fork just till dough follows fork around bowl. Turn out onto lightly floured surface and knead gently 10-12 strokes. Roll or pat dough to 1/2 inch thick, dip cutter in flour, cut dough and place on ungreased cookie sheet. Bake at 450 degrees for 12-15 minutes. Serve biscuits open-face and spoon chicken mixture over top. Serve remaining biscuits with butter and honey. Your recipe sounds wonderful. I’ll be trying it soon!! Thanks.